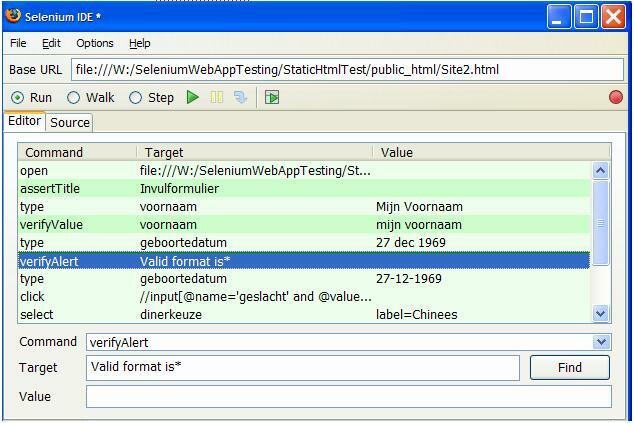 Recently, OpenQA – the organization behind Selenium – announced Selenium IDE. 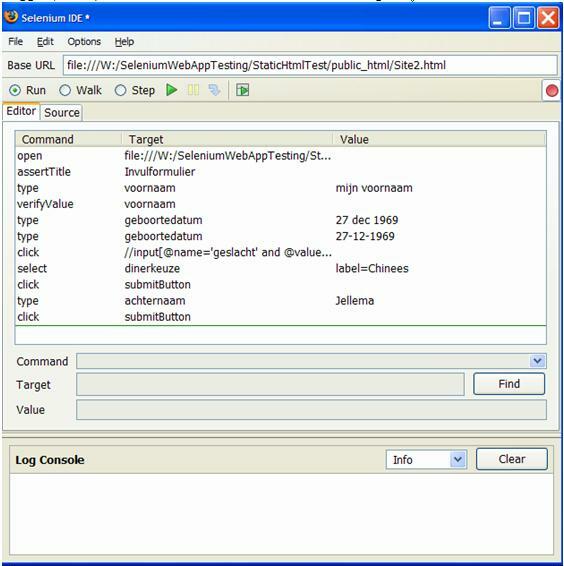 You can download this FireFox Plugin from http://www.openqa.org/selenium-ide/ . It is implemented as a Firefox extension, and allows you to record, edit, and debug tests. Selenium IDE includes the entire Selenium Core, allowing you to easily and quickly record and play back tests in the actual environment that they will run. 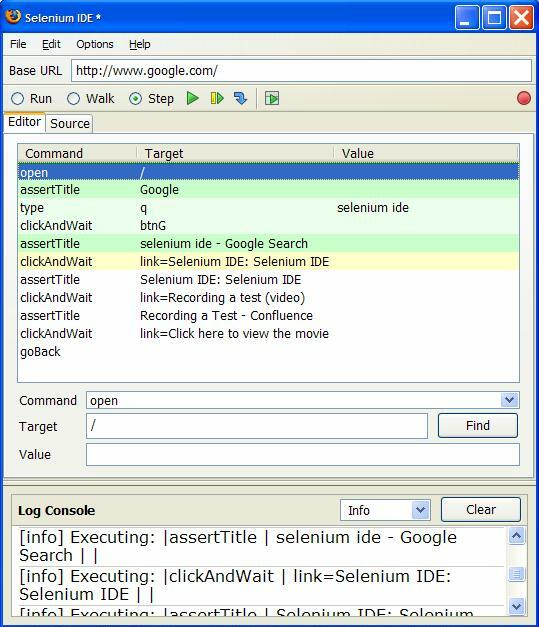 Selenium IDE is not only recording tool: it is a complete IDE. You can choose to use it’s recording capability, or you may edit your scripts by hand. With autocomplete support and the ability to move commands around quickly, Selenium IDE is the ideal environment for creating Selenium tests no matter what style of tests you prefer. See http://wiki.openqa.org/download/attachments/400/Selenium+IDE.swf?version=1 for a Tutorial (movie) that perfectly illustrates what the IDE can do. Note: where Selenium due to cross domain browser security constraints normally cannot be used to test web sites or web applications originating from other domains than the Selenium framework itself – that’s why Selenium must be installed under the document root of the web application you are testing – , this Firefox Plugin is not bound by such constraints. That means that it can be used to test any web application, including sites such as EBay, Amazon and Google. See at the end of the article. Let’s go and play a little with the Selenium IDE. Click on Firefox extension (requires Firefox 1.5 or 1.5.0. 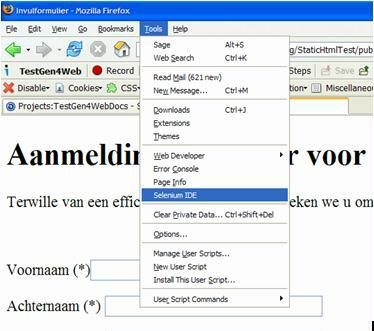 *) and the Selenium IDE will be downloaded as Firefox plugin. After download, you will have to restart Firefox to activate the plugin. From the File Menu, select New Test. Make sure that the Record button (upper right hand corner) is selected. All our actions have been recorded, as well as an automatically assertTitle for the document and the verifyValue that we explicitly added. Alas, the test is not yet complete. First of all, the verifyValue command lacks the value it should check for. 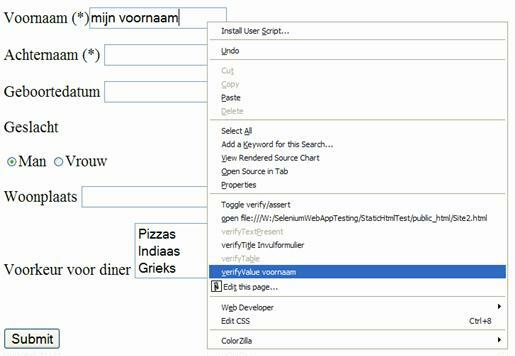 Select this command and enter the value “mijn voornaam” in the value field. It seems that the record action – type voornaam – is fooled by the onBlur trigger that fired and has recorded mijn voornaam as value to type. Change this to Mijn Voornaam. This is caused by the fact that we did not include commands to capture the alerts that are shown. Let’s rectify those omissions. 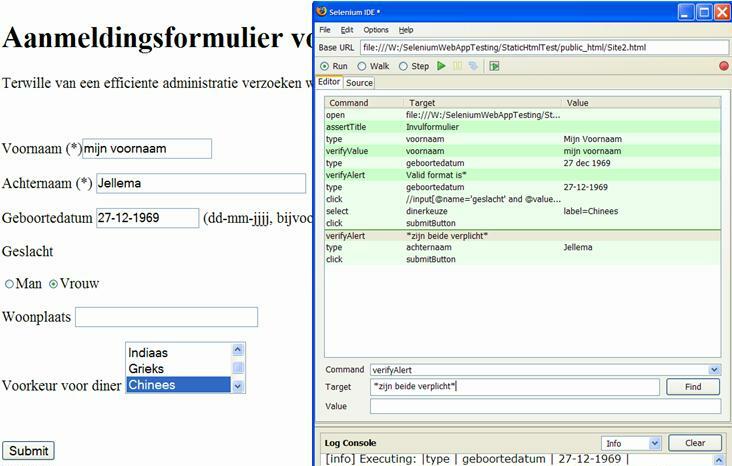 Select the second Type geboortedatum command (the one shown in red). From the RMB menu, select Insert Command. Set the command to verifyAlert and the Target to “Valid format is*”. Position the IDE on the top right hand corner of the browser window. Now run test again. The test should succeed now. You can follow all actions taking place in the browser window while the test is being performed. If you want to reuse the test or employ as static html documents like the ones we have used before, you can save the test from the File Menu. Save the current test as TestSite2b.html to the selenium\tests directory – where the other TestCase documents are also located. Open the TestSuite.html document and add the TestSite2b.html TestCase. 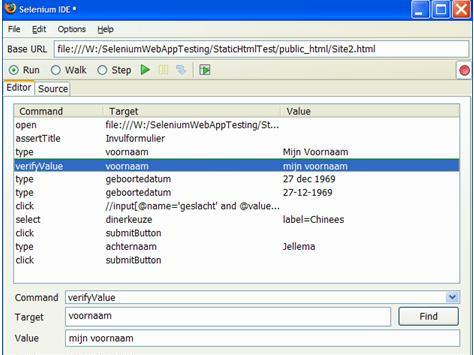 Now open the TestRunner.html document in the selenium directory and verify that the TestSite2B testcase has been added. Run the TestSite2B TestCase to verify that this test that we created with the Selenium IDE is equivalent to the testcases we have earlier created by hand. application, including sites such as EBay, Amazon and Google. 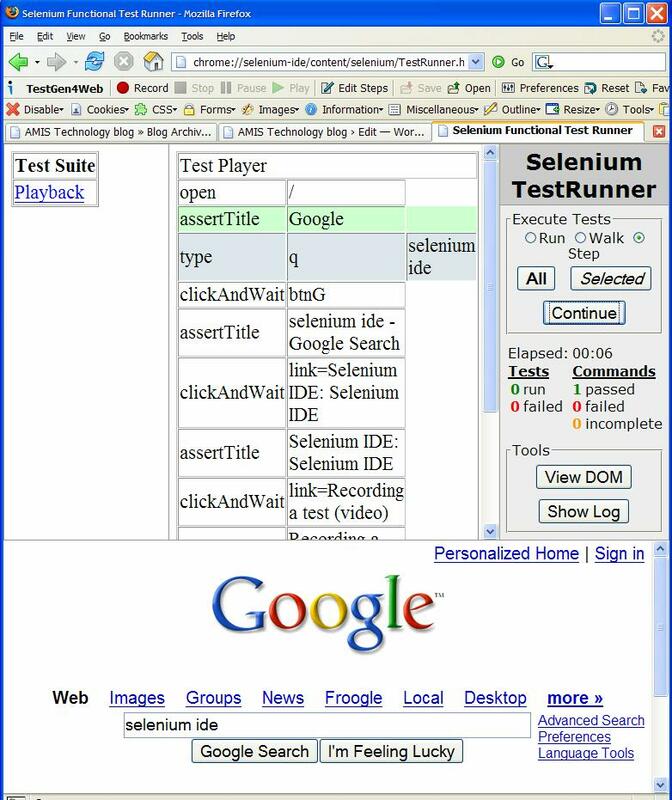 In a simple example, I open www.google.com and start the Selenium IDE. 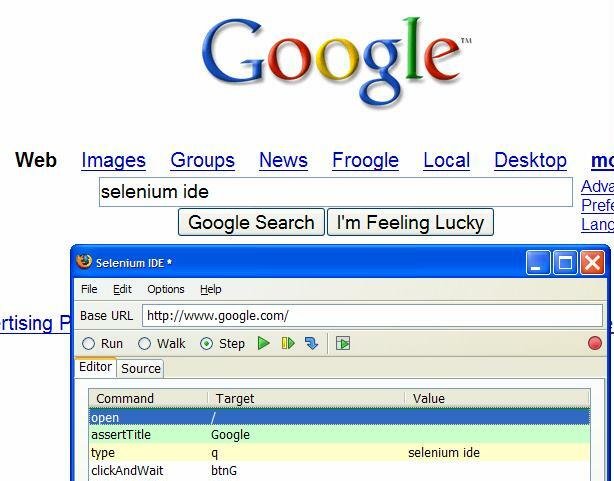 Next I type in the search field “selenium ide”, press search and inspect the results. 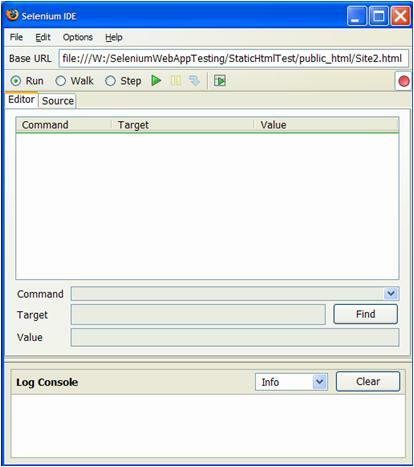 I click on the link for the Selenium website (http://www.openqa.org/selenium-ide/) , select the demonstration and start playing the movie. All my steps are recorded properly and the test can easily be replayed. I can add additional verification steps. 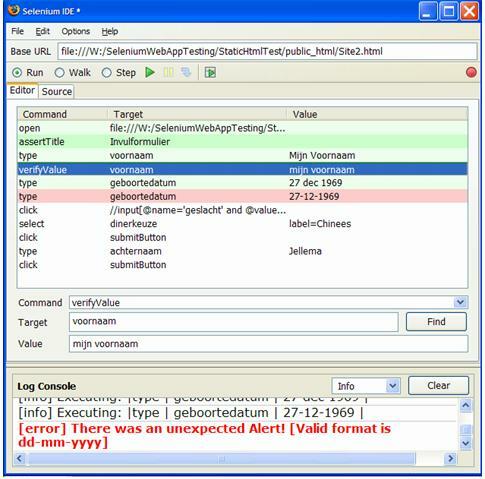 This test can be used to ensure for example that the Selenium IDE homepage is still on the first list of Google Search results for “Selenium Ide”. Not extremely useful, but a nice demonstration of how easy the Selenium IDE can be used to test (and script) just any Web Application. I am learning selenium ide . Can you please tell me how to use java script in test script to test a web based application . a csv file) and perform the test for every combination of values listed in the file. Perhaps you can file an enhancement request with the Selenium development team. A cool piece of software. Does Selenium allow to introduce variables into scripts?